In name anyway. I suspect there were other cases of kiters being involuntarily lifted by kites prior to this accident. ** I had been jonsing for some kite time for almost two weeks, saw some wind come up that morning and drove up to Boca Raton from Ft. Lauderdale to get some. Here is the updated KSI account about what happened next. 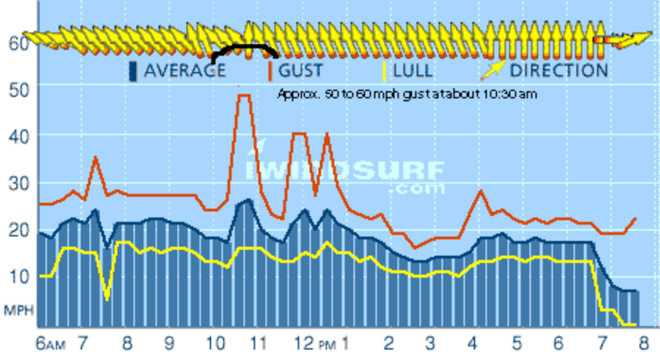 I had just launched my Naish AR5 9.5 m and was still onshore when I was apparently hit by a very strong gust. The AR5 was my first four line kite, I think it was the first one brought to market too. I was wearing a skateboard helmet, impact vest, gloves and was using a kite leash. I remember the kite making it halfway up to the zenith after initial launch while near the water, doing a three foot hop and almost nothing else. I ended up losing about a day and a half of memory to amnesia. I had hooked into the chicken loop just prior to launching. Up to that point winds had been stable at 15-20 mph side shore over two wind meter checks. I used to have a rule to wear a helmet windsurfing when it was above 20 mph that I carried into kiting. Have no idea why I chose to wear one on this day however. I had a choice of the 9.5 or 15.5 m AR5 kites at the time. I have no recollection of excessively squally weather or clouds in the area at the time of launch. Reconstructing things from Internet wind records and the launch area layout, a 50 to 60 mph onshore gust (see FIG 1 and 2) must have come up "lofting" me or involuntarily lifting me about 35 ft high and blew me at speed 165 ft. inland into the side of the house, (see FIG 3). Fortunately, I was later told I had cut a 60 ft. tunnel through the sea grape trees before striking the house. This served to slow me down substantially. Without it I perhaps would have struck at something around prevailing wind speed reducing the odds of survival substantially. Unstable squally weather was present for much of the day to follow as depicted in the iwindsurf figures. I remembered only about a one second image of descending towards some trees near a house (FIG 3) and at another time trying to unhook, looking down seeing my chicken loop tightly twisted on the harness hook and not movable. This happened before Quick Releases were much of a concern or commonly in use. approximate 50 to 60 mph gust at the time of launch. FIG.2) iwindsurf record for Jupiter on that date. Note the approximate 70 mph gust at 6:15 pm. and impact area in the trees near a house. 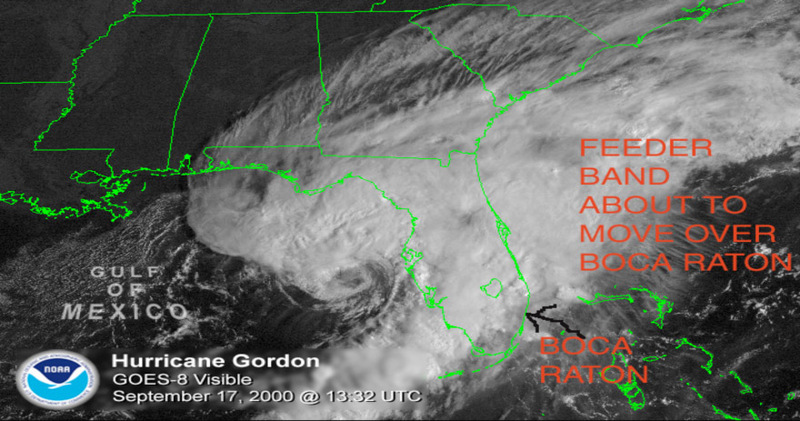 The deteriorating remnant of Hurricane Gordon was well to the north and west, north of Tampa Bay at the time of my launch. Feeder bands were swinging over the area from the west however based on the imagery in FIG 4 and 5. The weather was reasonably clear at the time of launch. The images suggest clearing conditions followed by storm cells swinging in from the west. Later on there were tornadoes sighted along with heavy squalls in SE Florida. 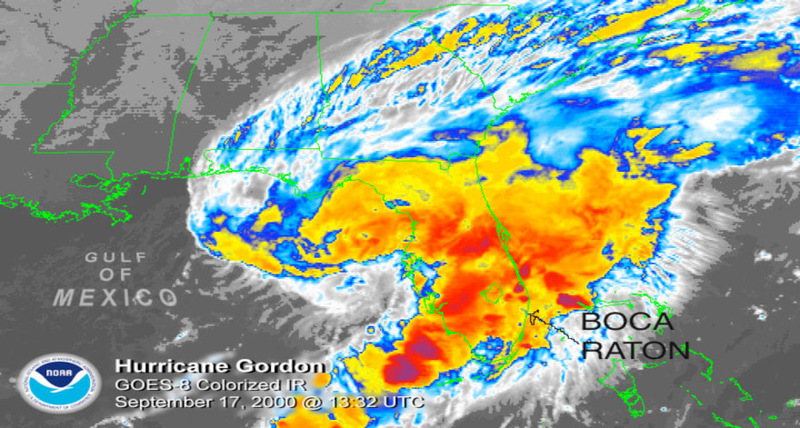 FIG 4) An IR image of Hurricane Gordon at 8:30 am local time. Note the weather in the area of Boca Raton appears to be clearing up at this early time. I fell into the trees and bushes just to the east of the house. Years later I spoke to another occupant of the home who said he heard a loud BANG of something hitting the side of his house. I managed to convince him and a pair of surfers who had seen the flight and impact that I was OK. Apparently a lady in a condo also saw the lofting and called 911. The lifeguards drove up later but failed to find me at that point in response to the call I understand. After convincing the people I was OK I apparently wandered around the beach with a severe concussion and lacerated foot for about four to five hours, half delirious. I lost about a day and a half of memory to amnesia. Figure 5) A view of the area. In that time I had taken my gear into my apartment building, left in front of the wrong door on my floor and returned outside. I would guess I was going back to the beach to retrieve my keys which were buried for safe keeping. 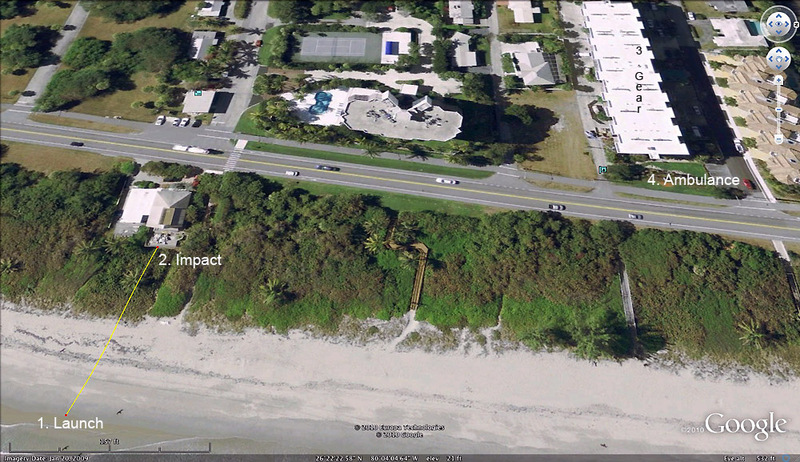 I only made it as far as the front lawn of the apartment along A1A. A friend from the building walked up and started talking to me as I was laying in front of my building on the grass. He later said I was talking gibberish, making no sense. He saw my lacerated foot and figured out that I should go to the hospital. He called an ambulance and off I went to the ER. So between points #2 and 4, I had managed to lose four or five hours, gone from memory likely forever. After 5 days in the hospital with a brain hemorrhage, a subsequent week of around the clock, coma-like sleep and relapse followed by three weeks of real thick headedness and loss of short-term memory, I started getting back on my feet. While still in the ICU I would check my cell phone voice mail and would return the same call from the office daily, "I'll be in tomorrow" each time. I had no short term memory, it was like being in a low budget kiting "50 First Dates." My voice returned to normal about two months later. Raton appears to be clearing up at this early time. The feeder band is swinging seaward from inland. My neurologists had said that without the helmet, the impact might well have been fatal. He had some doubt at the time about my making it through the first night in the hospital. It was pretty bad even with a helmet on. I was wearing a marginally padded skateboarding helmet. Since that time I have changed to a much better helmets. I recovered pretty much completely after three months and went back to kitesurfing having what the neurologist called a "miraculous recovery". I was also wearing an impact vest and gloves which I credit with saving me from other injury. 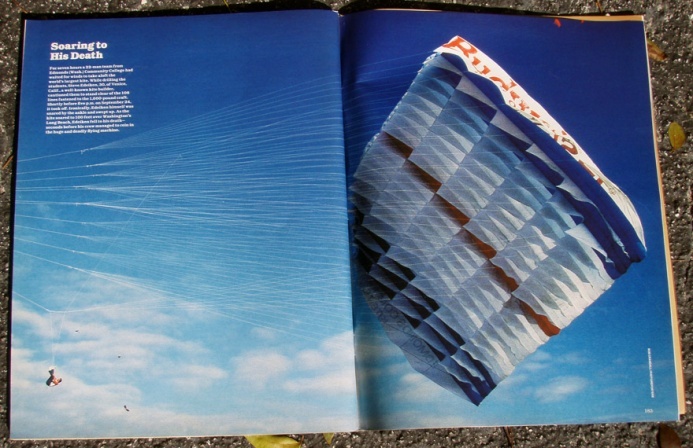 My kite was left drapped over the house for about a week while I was in the hospital. I ended up having to buy it back a few weeks later from the home owner's maintenance man for $100..
1. AVOID UNSTABLE WEATHER. Kite depower systems may or may not work properly under such conditions. Alternatively, you may simply not have time to deploy them. A gust of as little as 10 mph can cause a serious lofting and injury if you set yourself up for it. Approaching 20 mph or much higher, anti-lofting technique may have less effect on keeping you safe. 2. Check forecasts, weather radar and real time wind reports for evidence of unstable weather. If it is in the area or moving in, don't go kiteboarding. Tropical systems such as depressions, waves, hurricanes can have powerful embedded squalls. These squalls can be in the central mass of the weather system as well as in feeder bands that can extend over many hundreds of miles away from the center of the weather mass. In effect weather can be relatively mild but change dramatically if a feeder band crosses over your area. http://groups.yahoo.com/group/kitesurf/ ... EFERENCES/ for additional ideas on this important subject to kiteboarders. 3. Keep your kite low and to seaward as possible while on land or near hard objects. You may be dragged instead of lofted if a strong gust hits. In theory being dragged is better than being lofted, if you react properly and fast enough. Otherwise you can be very seriously injured by dragging. Checkout: 4. LOFTING AND HOW TO TRY TO AVOID IT in the KSR for more ideas on this subject. 4. Wear a helmet, impact pfd, gloves, whistle and a hook knife. A helmet was credited as saving my life. 5. Don't launch hooked or snap shackled in to your control bar. Someday this practice may cost you if not in the near term. 6. All riders should seriously consider using quick release chicken loops and fixed harness lines. Consider the pros and cons of using a snap shackle to secure your chicken loop. Using a reliable quick release loop may be superior to using a snap shackle. If you do use a snap shackle, rehearse very frequently what you will do if a strong gust hits and you need to release the snap shackle. If you hook in or shackle in near hard objects you should accept that you may be seriously lofted or dragged and will not be able to react correctly or fast enough to avoid this outcome. Launching unconnected to your control bar is the only reliable way to improve the odds of avoiding being dragged or lofted at launch should things go wrong. In some ways, lofting or dragging in sudden gusts are one of the most dangerous conditions that kitesurfers face. Many riders have been seriously injured and some killed, around the world to date because of lofting. A new rider was killed in Spain last week and another lofted into a coma in Florida in the last few weeks by stormy conditions. If you are offshore, such conditions may be more survivable. Of course this is allowing that you don't interact with lightening which isn't a good assumption near squalls. If you are on land or near hard objects you may be in for a good dragging and possible kite damage if your kite is low. If the gust is strong enough keeping your kite low may not keep you from being lofted. If you are hooked or snap shackled in, you may be badly injured or worse by the resulting, involuntary jump or lofting. Fortunately, these gusts are not necessarily commonplace in many launches but they do occur at most launches. Such high gusts are not uncommon in areas visited by tropical weather systems. Kitesurfers should avoid and come in well in advance of unstable weather as such conditions may have the potential for high, sudden gusts with little warning. Tropical systems and other sources of squally weather should be avoided. Kitesurfers may have dozens of great sessions in such conditions with the potential of one very hazardous or possibly terminal session. Reaction decisions made in seconds will likely determine the outcome of the incident. Rehearse dealing with unusual conditions and scenarios mentally and visualize your reactions frequently. It is important to remember that if you are lofted in a high wind gust, you will likely achieve a speed of travel and impact approaching that of the gust. So you could hit very hard and fast with serious, possibly terminal injuries. The harsh reality is that kiteboarding safety gear is not fully reliable at this time. The best thing that kiteboarders can do is to use adequate knowledge and good judgment to NEVER place themselves into emergency situations. Beyond that wearing minimal protective safety gear and using a tested depowering leash is about all that you can do. Avoid squalls and unstable weather. At the same time, I concluded after my accident that being picked up by kites and blown downwind might be a frequent thing in the future of kitesurfing and deserved its own name. Came with the name "lofting." I started using it on the old Egroups (changed to Yahoogroups), later on Kiteforum.com and it caught on.